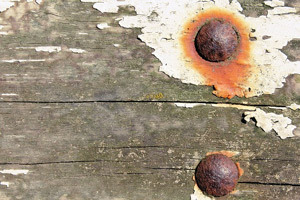 We all know rust when we see it, the familiar reddish-brown flaky coating found on hinges, nails, screws, and the like. As a form of corrosion, rust is one of the main differences in comparing ferrous metals vs non-ferrous metals. The key is iron rusts, and ferrous metals are metals derived from iron, and include carbon steel, stainless steel, mild steel, wrought iron and cast iron. 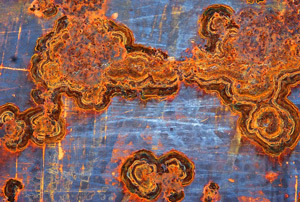 Rust occurs when iron reacts to exposure to water and oxygen, a reaction known as oxidation. A piece of iron left exposed to moisture and oxygen will rust because of the interaction and reaction between the metal and elements. Depending on the intensity of the exposure it could take a few days or up to a year, but it will inevitably rust if not protected. Yes, but only if that alloy is made with ferrous metals. It is important to understand what an alloy is; simply a combination of two or more metals. The presence of iron is the determining factor in whether or not a metal will rust, regardless if it is an alloy or not. For example, carbon is mixed with iron to make steel, an alloy of iron. As strong as alloy steel is, it doesn’t make it any less vulnerable to rust when exposed to the elements since it is ferrous (containing iron). 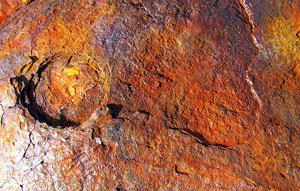 There are three different forms of rust, some more common than others. Occurs on unprotected steels used in buildings and bridges. This type of rust can rapidly reduce the thickness and strength of the metal and means your infrastructure is crumbling and needs to be replaced or repaired quickly. This happens when iron oxide deposits come in contact with metals like stainless steel (as rust resistant as it is). Rust can spread from the point of contact over the metal. The familiar flaky rust that’s found in the gaps between nuts and bolts is known as crevice corrosion. This type of oxidizing occurs in confined spaces, i.e., the crevices of an object. Ferrous metals, those made of or from iron, are the only metals that can rust, but all base metals can corrode. Corrosion occurs when metals begin to deteriorate as a result of chemical reactions between a particular metal and its surrounding environment. Rate of deterioration will depend on the environmental conditions. Gasses or moisture which comes in contact with the metal will determine the rate of deterioration. In general, rust and other metal corrosion can be avoided by adding alloys to a pure metal to create corrosion-resistant non-ferrous alloys, along with carefully managing a metal’s environment. Corrosion resistant alloys consist of metals such as chromium, cobalt, nickel, titanium, or molybdenum. 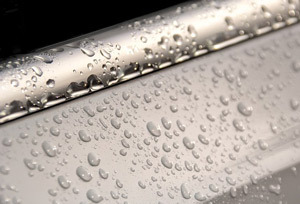 When combined with other metals they can promote corrosion resistance and create alloys that offer reliable protection from corrosion, which greatly reduces the need for costly and expensive maintenance and repair. Corrosion-resistant alloys are broadly used by various industries, especially those that function in environmentally challenging conditions. These alloys provide reliable performance in the fields of health, energy, pharmaceutical, gas, oil and others.